Over the weekend our family visited The Spicy Lamb Farm for their Shearing Days event. In total, we spent about an hour and a half at the farm and another hour hiking. It was a great experience and we all had a lot of fun. If your family likes the outdoors and wants to learn about a sheep farm, it's definitely worth the trip. Both of our kids love being outside, and my son often talks about being a farmer when he grows up. Because of this, we knew they would enjoy visiting the farm. And because neither my husband or I had ever seen a sheep being sheared, we were excited to go as well. When we first got there, one of the workers came over and offered to show us around. He took us through the barn where we got to see rabbits, baby chicks, and a ram. Then we walked around to the pastures to see the horses, a pig, lots of sheep, and even a peacock. Once we finished our walk around the farm, we decided to go on a hike. The Buckeye Trail and Valley Bridal Trail (Cuyahoga Valley National Park) are only a short distance from the farm, but we opted to walk about 3/4 of a mile to the Train Station in Peninsula. 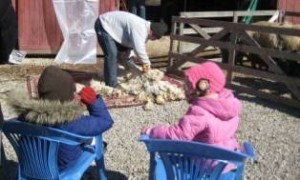 After checking out the station, we headed back to the farm to watch the sheep shearing demonstration. It's really quite amazing how much wool comes off of one sheep. And how strange the sheep looks after it has been sheared! 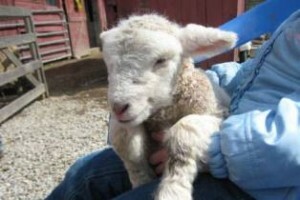 We ended the day by holding a baby lamb that was less than a week old! I wasn't expecting to get the opportunity to hold one, but jumped at the chance when one of the workers asked if we wanted to. My daughter thoroughly enjoyed it as well. It was a fantastic way to end our trip. It's a farm, so you will get dirty. Make sure to wear comfortable shoes/boots you don't mind getting dirty. And bring along an extra pair to change into for the car ride home. Incorporate a hike. 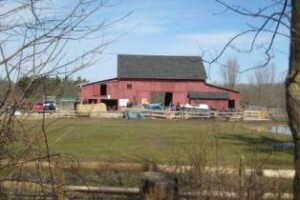 The Buckeye Trail and Valley Bridal Trail are only a short distance from the farm. Or you could do what we did and hike to downtown Peninsula. Visit the train station or the shops and restaurants. In addition to the Shearing Days events, the farm has quite a few activities planned for the year. 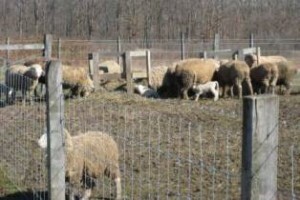 View The Spicy Lamb Farm website for more information.